The EnviroVent 2 is what is known as a Downdraft Vent. 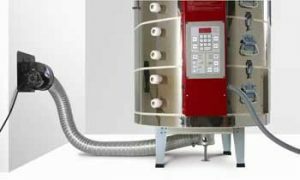 Downdraft vents actively remove fumes from your kiln before they can enter the room and vent them outside keeping your studio free of smell. It works by using a wall mounted fan to draw a very small amount of air through holes drilled in the slab (floor). The amount of air drawn is determined by the number and size of the holes drilled. Holes are also drilled in the lid in a specific pattern designed to direct the air in a way that does not affect your ware. These holes can be drilled in the factory when you order your kiln or easily drilled in your classroom or studio simply by following the instructions in the manual. We even provide you with the drill bits! The Skutt EnviroVent was the very first commercially available downdraft venting system on the market, introduced in 1987. Improves firing consistency. The vent also helps to prevent different color glazes from migrating. You can now fire greens and reds on the same shelf with excellent results. Fits popular kilns. The EnviroVent 2 fits Skutt 16, 12, 10, and 8-sided kilns as well as many other kiln brands. Fits popular kilns. The EnviroVent 2 has a spring-loaded collection cup that keeps a tight seal on the kiln as it expands and contracts without stressing the bottom slab. Ideal for automatic kilns. The EnviroVent 2 makes firing kilns such as the Skutt KM series much more convenient. There’s no lid propping. Just put plugs in all the peepholes and press start.